Natural family and guard dog. 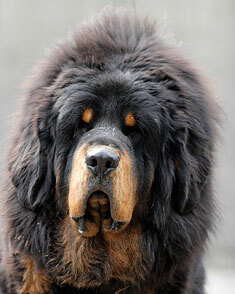 The Tibetan Mastiff dog breed originated in Tibet. 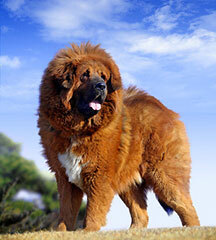 Tibetan Mastiffs range between 25 and 28 inches (61 to 71 cm.) `in height. Tibetan Mastiffs may be chocolate, blue & tan, sable, gold, cream, or red, with or without tan markings. Tibetan Mastiffs require weekly brushing. Their coat grows thicker in the winter and this is shed in the spring/summer period, at which point they should be brushed once a day for 30 minutes a day. Tibetan Mastiffs are not suited for hot climates. They are prone to hip dysplasia, skin conditions, thyroid problems, ear infections, and an unusual genetic problem called Canine Inherited Demyelinative Neuropathy (CIDN). The Tibetan Mastiff can be expected to live about 15 or more years. Tibetan Mastiffs are not suited for apartment life and require a medium sized yard. This breed should be brought indoors at night as it is a nocturnal barker, but will be quiet in the house. The Tibetan Mastiff is a digger and a climber and will try to escape, so it requires a well fenced yard around its perimeter. Tibetan Mastiffs enjoy walks but are not suited for jogging. They are also not interested in playing with balls. Find Tibetan Mastiff Puppies with our Free Breeder search!